Northwind Summit is a mountaintop dragon lair on the border between Eastmarch and the Rift. 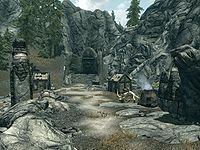 It is located a short distance northwest of Shor's Stone, northwest of Riften and far south of Windhelm, on the highest point in the Rift. To access the summit, you can travel through Northwind Mine, found on the northern side of the mountain, or climb to it, starting at Shor's Stone and heading just a little ways south down the path until you see a slightly gentler slope of mountain to the right. The summit is an abandoned mammoth hunter's camp with three dilapidated structures and mammoth skeletons. The word wall for the Aura Whisper shout is against the mountain, with the boss chest located just in front. A smelter is to the west, between two of the structures, and an adept-locked chest is inside the farthest structure to the west, just on the precipice of the summit. The stairs to Northwind Mine are on the northeast end of the summit. If Dragon Rising has not started, the wall is only defended by a few weak skeletons, making the word wall extremely easy to reach before starting the main quest. 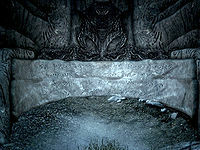 A dragon will be guarding the wall otherwise, and is a possible target for the related quests. A moonstone ore vein is located above the Northwind Mine entrance. If the dragon crash lands during your battle with it, the scripted terrain alterations will make it impossible to enter or leave the northwestern-most cabin (the one containing the locked chest), meaning that if you are inside, you will be unable to get out. If you can find a way to kill the dragon while trapped in the cabin, with a follower or summoned creature for example, you will be able to fast-travel out once you leave combat. This page was last modified on 1 July 2018, at 16:47.